Final Doom was a bit of a joke, even when it was released. Nobody really bought the “final” part. Despite id’s assertions that they had moved on, it seemed highly unlikely anyone would ever kill the golden goose. And while id eventually found their way back to the series, Midway was ready in the interim to develop and release the next Doom we all expected, on the one console we didn’t. 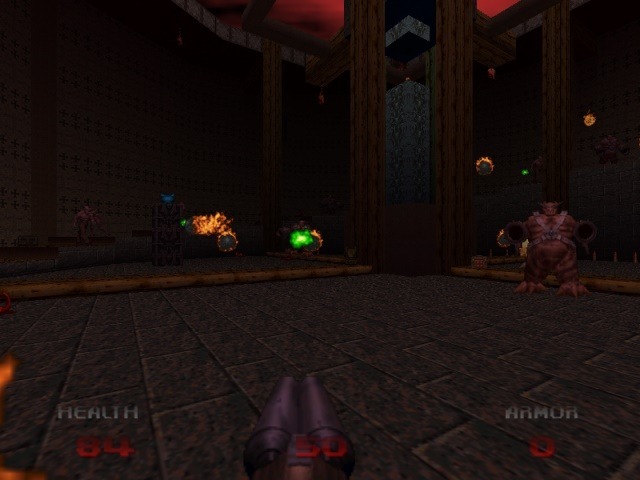 Doom 64 is a half-remake, half-update to the original Doom. It’s a title obviously influenced by Quake, with facility artwork that wouldn’t look out of place in Quake’s techier levels, none of the original’s shotgun racking animations, and an audio track comprised solely of background ambiance and mewling demon babies. The pace is tweaked as well, with a slower run speed and a greater focus on caution and atmosphere. All of which form the basic test of whether you’ll like Doom 64. 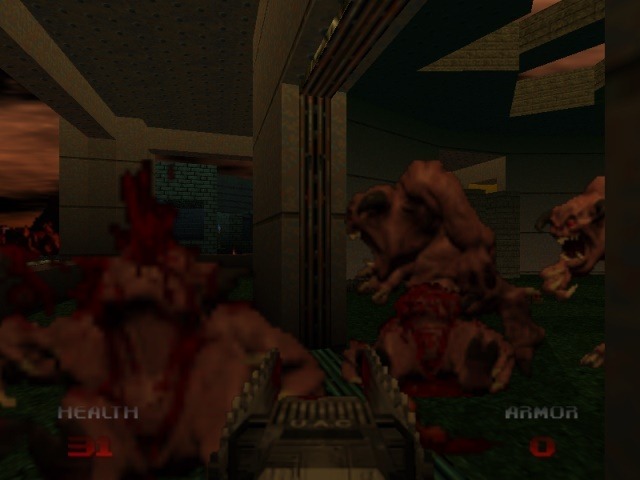 If the original Doom to you was high-octane splattery fun set to MIDI mimicries of Pantera and Slayer, and if you were one of the ones furious when Doom 3 decided to ape Half-Life, then you will hate Doom 64. 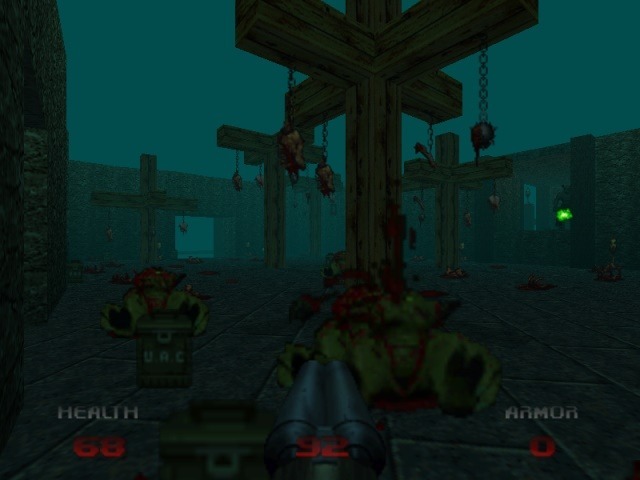 On the other hand, if you naturally played Doom slow, creeping cautiously through a deadly sci-fi haunted house, you’re more likely to be in sync with what Midway has done here. This is not a game about raw action as much as it is about devious traps, basic puzzles, and more than a few cheap scares. Its level design is frequently inspired, its enemy placement has certainly taken notes from the masters at id, and it’s a surprisingly excellent campaign overall. Provided, of course, that you’re willing to take it significantly slower and with no sweet metal riffs to embolden you. The plot has you, the anonymous space marine from Doom 1 and 2, returning to Mars after a lingering demon named the Mother Demon resurrects (and mutates, hence the new designs) all the monsters you slayed before. Sending you in alone seems like a good idea to someone, and your journey begins through renovated science complexes on your way back down to Hell. This doesn’t mean you’re fighting through the same levels though – with the exception of a remake of Doom II‘s infamous “Dead Simple” arena, you won’t see any nods or recreations of previous maps. It’s all new, albeit familiar, challenges. Fog rarely appears, but to great effect when it does. 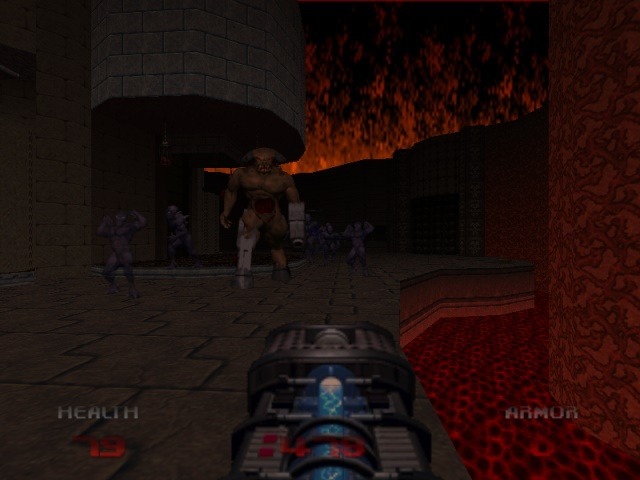 While the earlier Dooms had some brighter colors and even a touch of camp, Doom 64 is purely dark, foreboding, and sinister. Lighting is still sector-based, and can still fade and flicker as it has throughout the series, but basic color is now a value. As was introduced with the Playstation port, the area around doors now glow faintly with the color of their corresponding key. Delightfully cliched red emergency lighting makes appearances. Toxic goo gets an appropriately lime glow. Colors also appear just for decoration, including lots of sci-fi reds and blues, and some flickering orange candlelight. The occasional advanced lighting effect (such as a ring of lights strobing around the edges of a room, further keep the surroundings engaging and you on your toes. Parts of the levels now move, to a greater degree than the original game’s crushing ceiling traps. This rarely happens, and never while you’re on the geometry in question, but you will see the occasional dynamic setpiece seemingly inspired by Duke 3D. In one, a key activates some drilling machinery that pounds a new passageway out of the ground nearby. In another, a giant block lowers from the ceiling and “stamps” stairs and ledges into the room before you, with another forging a key. Scrolling textures also give suggestion that certain machinery is active, and help further the idea that the sections you’re entering have some actual function related to their map names. Texture work is fairly strong overall. Cartridge size limits means plenty of repeats, but the lighting helps, and knowing this was being created for a console likely helped the artists create tiles that “loop” better than the console ports of the original PC chapters. Some software smoothing/AA is implemented here, as the N64 was known to do. It works better than in Duke 64 – again, the darker tones hide things well – and an interesting “smokey” look is present on the original hardware that isn’t in most PC mod ports (more on that in a bit). Monsters and guns are redrawn, both with an emphasis on being taken more seriously. The guns do look quite fierce, and waiting for the reveal of a classic monster’s new look suitably reinstates dread and anticipation for series vets. The newly double-bladed chainsaw still doesn’t help when surrounded. Doom 64 also ups the puzzle game significantly. Rooms frequently start with showing you the next key, just out of reach, and sending you off on the journey to get it. 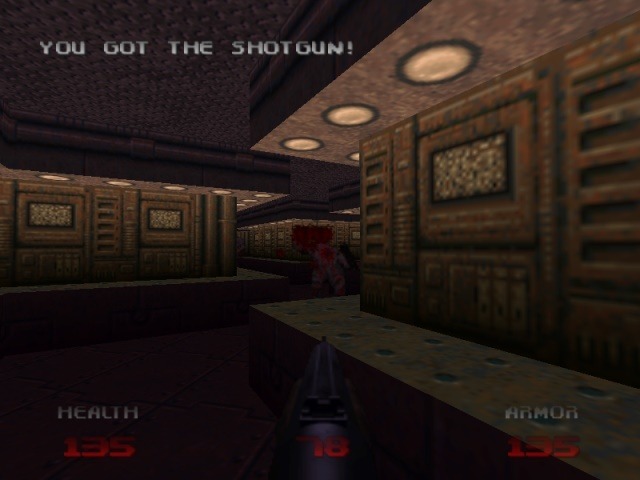 Remote cameras are now part of the game, and these are often used in optional puzzles – one shows you a plasma rifle atop nine columns, and you, at the base, must pick the correct column to lower. Secret levels require some real work to get to, and the game’s sole new weapon (the “Unmaker”) is fiendishly hidden across multiple levels. It’s also the first Doom that will lock you out of secrets or extra collectables if you miss it the first time. Keen ears need to be prepared for the sound of lowering walls, because you may not get another chance at what lies behind. Likewise, the difficulty is noticeably more sinister than id’s efforts. Though the game starts off easy enough, it will soon build to Plutonia Experiment levels of dickery (this game loves Hell Knights more than any other edition). Monster closets are present, but rare, with the game instead favoring straight-up teleporting enemies in your face. Getting trapped by these spawned enemies is commonplace, and it often seems that using a previous death to know what’s coming is the only solution. Crushing ceilings and floors that drop into monster pits are used heavily, as well as new wall-mounted traps that shoot darts when triggered by a floor plate. Also, it’s the first Doom I’ve played that will intentionally trap you. id never let you fall into a lava pit with no lift to take you back out. Midway will. The big guy, with some new Nightmare Imp minions. 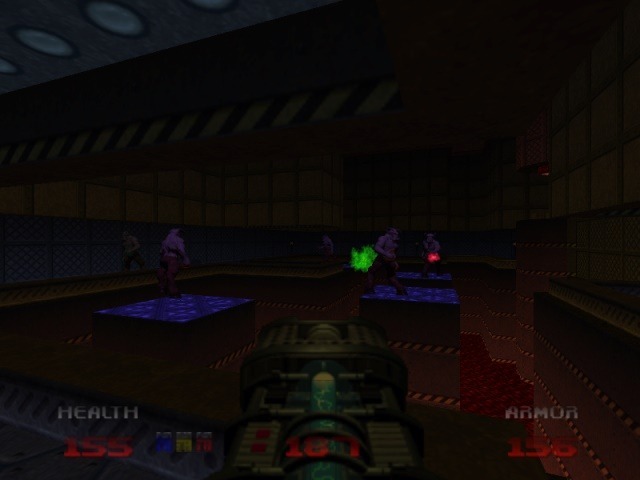 These levels also demonstrate real knowledge and adaptability to how a Doom player plays. The teleporting enemies often appear to choke off an escape, or trap a player that’s rushed carelessly ahead. Though rare, pulling every switch sometimes results in punishment (like a row of three switches where two are traps). One room has a switch that spawns imps and another than spawns zombies. Only after taking out each group individually, do you realize you could have flipped both and had the monsters fight each other instead. Series newcomers will absolutely want to stay away from the harder difficulties, but vets will be presented with a game that has grown a touch smarter since their last encounter. There’s one fatal flaw, however, and that’s the controls. Surprisingly, this feels like a serious PC Doom game, placed on a console with a famously awkward controller. The digital pad is far too slow for turning, and the analog stick is awfully imprecise. You have five different control schemes (no user-defined options), and confoundedly, none of them let you use the C buttons for movement. This means the stick will always run and turn, with all the wobbling that brings with. It’s playable, certainly, but lacks a level of precision that makes the hardest difficulties a very questionable prospect. 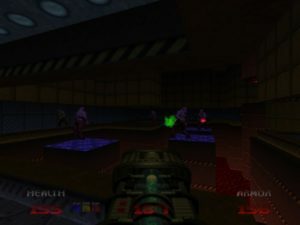 Portions of levels also require you to master the awkward art of the strafe-jump (run off ledges at an angle whilst strafing, to get the speed necessary to clear the gap) – something the PC games never did, and a move that gets fiddly on a gamepad. The game’s also extremely dark. Your only display options are a generic brightness slider, and at its brightest setting, you’ll still be straining to make out objects. When I played originally in 1998, I remember having to fiddle with the settings on my TV in addition to the game’s slider, which made me very grumpy indeed. While it works well for dread and horror on the one hand, it’s oppressive and annoying when trying to actually play. Emulators, admittedly, may have better luck. The final disappointment is that the game is extremely scarce on new weapons and enemies. As mentioned, the Unmaker laser is the game’s most guarded secret, and regular players simply won’t find all the pieces without help. The only proper new enemy is the Mother Demon, who appears as the final boss. Regular levels do include a “Nightmare Imp,” which is just faster, a bit transparent, and heaves quicker, purple fireballs. You won’t find any new challenges beyond the new levels, and worse, not all of Doom II’s crew made the cut. Revenants, Arch-Viles, chaingun guys, and Spider Masterminds all got benched. I remember there was real concern about whether anyone other than id could make a solid Doom game, and Final Doom certainly didn’t put that speculation to rest. Doom 64 did, albeit a touch too late. Midway’s creation is an excellent final send-off, and a true challenge to series fans. Unfortunately, N64 exclusivity was a strange choice that surely deprived it of greater success. Wobbly console controls and a brightness setting that frankly feels miscalibrated didn’t help either. And if you were into Doom for the fast action, hard metal, and crimson demon guts, well, the series definitely ended for you after Doom II. 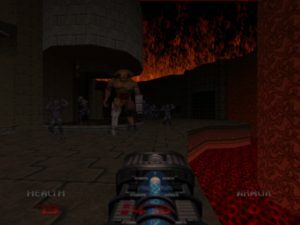 Final Note: There are currently two mods that will let you play Doom 64 on your PC, and of these, Doom 64 EX is by far the best, if you’re looking for an authentic experience. Doom 64 is also much tighter and more enjoyable with the mouse and keyboard controls (and some advanced gamma settings too!) Highly recommended. Looks great, as do the new monster and weapon designs. Smart design tricks and challenges series vets. Spookiest of the Doom games as well. N64 controls aren’t very precise here – punishing at the harder difficulties because of it. Very dark on the native hardware. New levels, but the same weapons and monsters. No longer fast and heavy metal.